The event will be held at the "Pole Communication Multimedia" amphitheater located at La Rochelle, in France. The WCRP/IOC Sea Level Conference, which will be held in New York, NY (USA) and hosted by The Earth Institute, Columbia University, on July 10-14, 2017, had a very good response from the scientific community during the abstract submission period. Many excellent contributions have been received from around the world, and from a diverse community. Due to technical issues during the last few days with the online submission system, the deadline for abstract submissions has been extended to February 28th, 2017. We encourage our colleagues from all nations to submit their abstracts and we are looking forward to seeing them at the conference. The deadline for requests for travel support has also been extended to 28th February 2017. In case you want to apply for travel support, this can be done during the abstract submission process. Eleven years after the 1st World Climate Research Program (WRCP) sea level conference held at the Intergovernmental Oceanographic Commission of UNESCO (Paris, 2006), and three years after the last Assessment Report of the Intergovernmental Panel on Climate Change (IPCC), the conference will provide a comprehensive summary of the state of worldwide climate-related large scale sea level research. I. Identify the key factors contributing to past, present and future regional sea level rise and variability. II. Organize a systematic attack on the error budget of these factors. III. Identify stakeholder needs for sea-level information for coastal planning and management purposes. IV. Define the requirements for new and augmented research, technical development and observations consistent with the above. The event will be held at the "Earth Institute Columbia University, Lerner Hall" at New York city in USA. See more information at the Conference website. "Integration of GNSS into Water Level Observation Networks: Priorities, Technologies, and Benefits"
Tide and water level station records are some of the longest and most meticulously-kept earth observation records, but these data were historically only tied to local staffs or nearby bench marks on land. 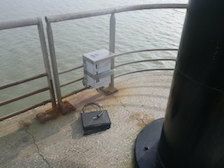 Integration of GNSS at these stations not only provides efficiencies in operational station maintenance cycles, but also adds value to these long-term water level records by connecting them to national and global reference frames and enabling the quantification of relative sea level trend components. Despite the recognized value of fusing these oceanographic and geodetic tools, only a subset of global water level stations fully leverage GNSS. This session invites the community to share new research that demonstrates the value of GNSS-linked or GNSS-enabled water level stations, exchange knowledge about best practices for instrumentation, and showcase innovative technologies or methodologies that will advance reliable, effective, and informed use of GNSS in water level observation networks. Full session details and an abstract submission link are available here. The abstract submission deadline is on 1st August 2018 23:59 EDT. Session P05 - Advances in Monitoring, Detecting, Understanding, Hazard Assessment and Forecasting of Mean and Extreme Coastal Sea Level. The deadline for abstracts has been extended to 12th March, 2017. Rapid growth of coastal populations and nearshore development have increased the need for sea level data to understand, monitor, detect, predict and forecast current, long term and extreme variability. 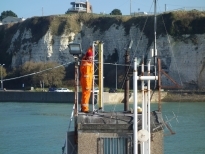 Data from sea level monitoring stations have a wide range of applications including research, planning, hazard assessment and operational and warning systems. The session seeks contributions on developments in technology and operations as well as the status of sea level stations and networks. It also welcomes presentations on advances in scientific research and studies on understanding the dynamics of sea level change, as well as extreme sea level events. The session will also discuss the use of sea level data for coastal operations, hazard studies and warning systems. Advances in sea level data use for the detection and forecasting of tsunamis, storm surges, climate change and other sea level extremes are welcome, as well as contributions on techniques of sea level data analysis and data archival. 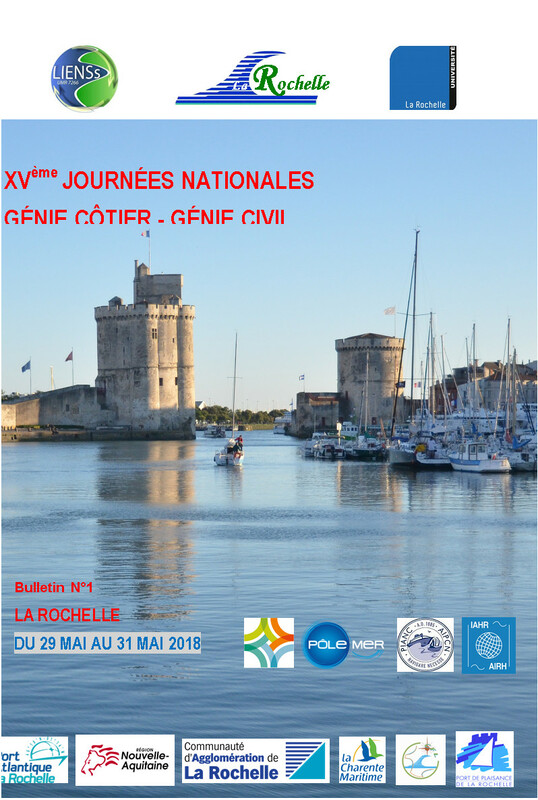 The XVth National Conference "Génie Côtier - Génie Civil", JNGCGC 2018, organised by the association: "Centre Français du Littoral", the University of La Rochelle and their partners, will take place in La Rochelle, from the 29th to the 31st of May 2018. This is a provisional list of sessions, some adjustment may be made nearer to the time. Every session will start with a keynote presentation followed by a series of oral and poster presentations. We welcome abstracts from all attendees. Registration covers attending the main meeting including refreshments and lunch, icebreaker reception and conference dinner. Standard Registration will open 21 March and close 30 April 2018 priced at £120.00 per delegate. 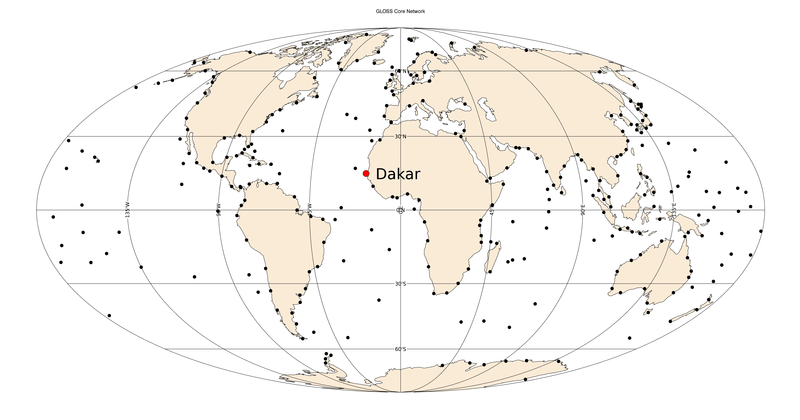 Dakar (Senegal) hosts one of the longest sea level records available in Africa with a multidecadal time series available at the Permanent Service for Mean Sea Level (PSMSL). The current tide gauge is operated by the University of Hawaii Sea Level centre (UHSLC) under the framework of the Global Sea Level Observing System (GLOSS) established by the Intergovernmental Oceanographic Commission (IOC) of UNESCO in 1985. Click on the left icon to display a map showing the GLOSS core network of stations, and the Dakar location within this network. This station is locally maintained by the Lighthouses and Beacons Sub-Division of the Port Authority of Dakar. 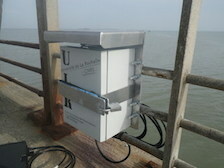 Despite the presence of permanent GNSS stations located in Dakar, these stations are distant from the tide gauge, and may not represent the vertical land motion actually experienced by the tide gauge, which is located inside one of the largest harbours in West Africa (Le Cozannet et al., 2013). 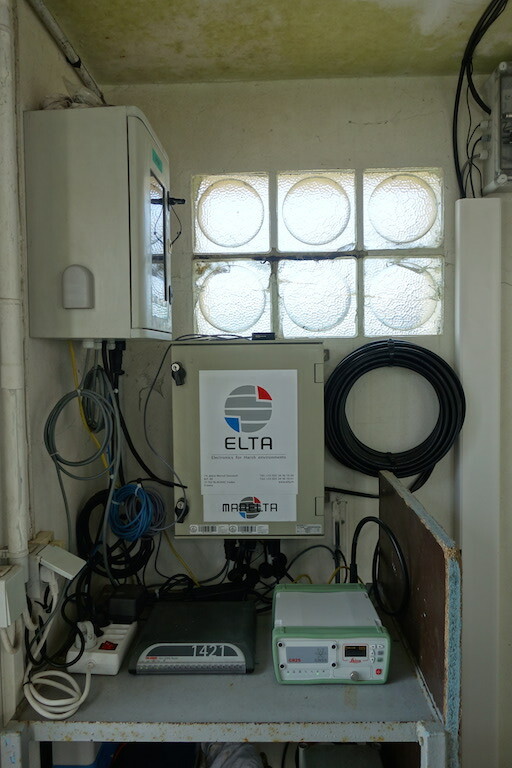 See for instance the DAKA GNSS station, which in addition is decommissioned since 2007 and has discontinuities in the series, which are harmful for estimating an accurate trend. Hence, a geodetic GNSS station dedicated to monitoring the vertical land motion at the very tide gauge was highly desirable following the guidelines of the last GLOSS programme implementation plan. 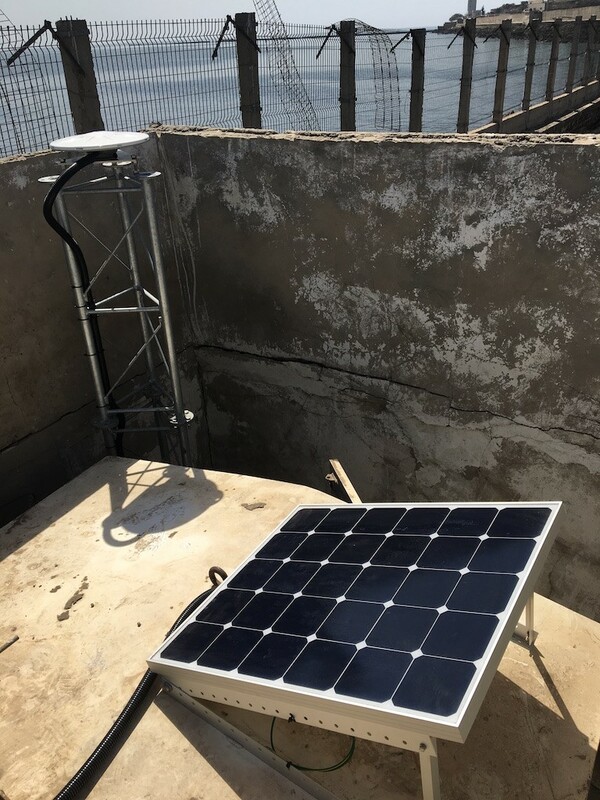 In early November 2017 a France-Senegalese team composed by SONEL partners and ANAT (Agence nationale de l’Aménagement du Territoire) installed a new permanent GNSS station at the very top of the GLOSS tide gauge. 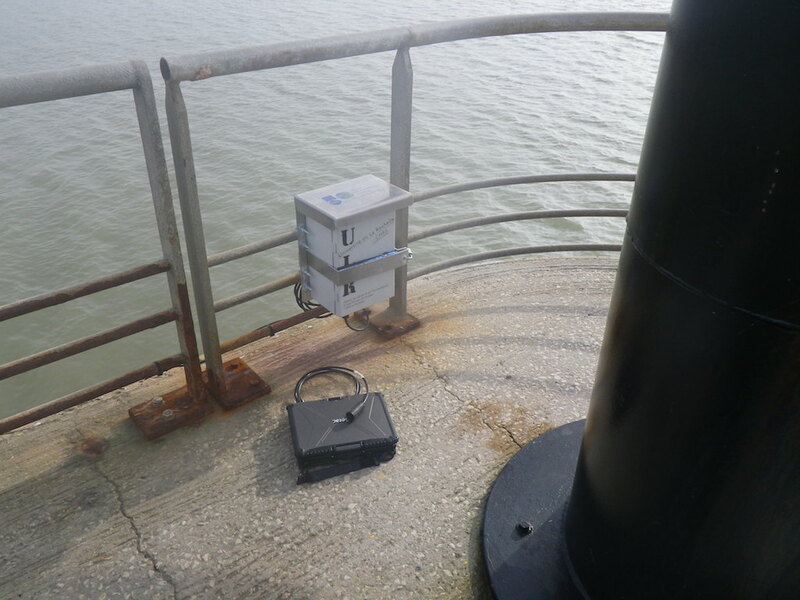 A precise levelling was performed to link the GNSS antenna to the tide gauge benchmarks. 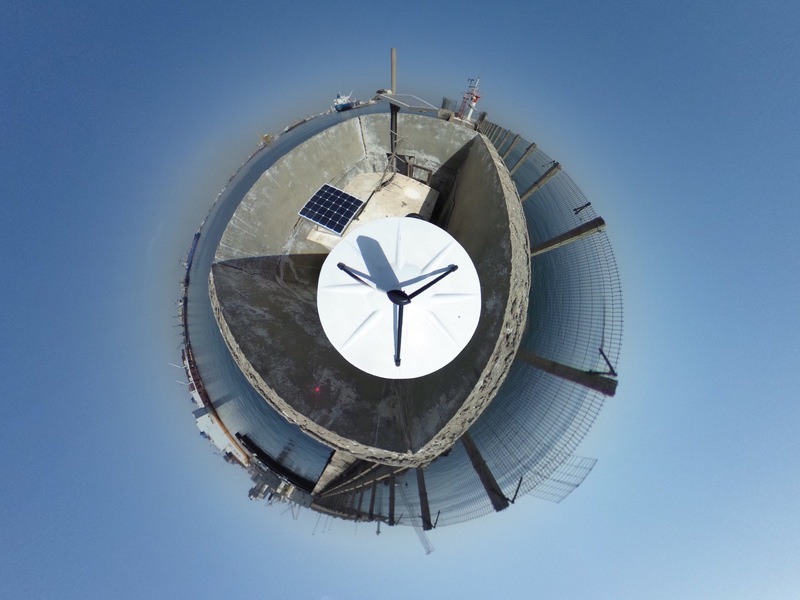 The Trimble Zephyr Geodetic antenna lies on top of a 3 meters galvanized steel mast anchored in the concrete wharf near the tide gauge hut (Click on the icons to enlarge) within a meter distance from the radar sensor at the Southern jetty of the Dakar commercial harbour. This GNSS station is autonomous and powered by a solar panel. The measurements from the Trimble NetR9 GNSS receiver are transmitted as daily RINEX files with a sampling rate of 30s through the 4G local network. 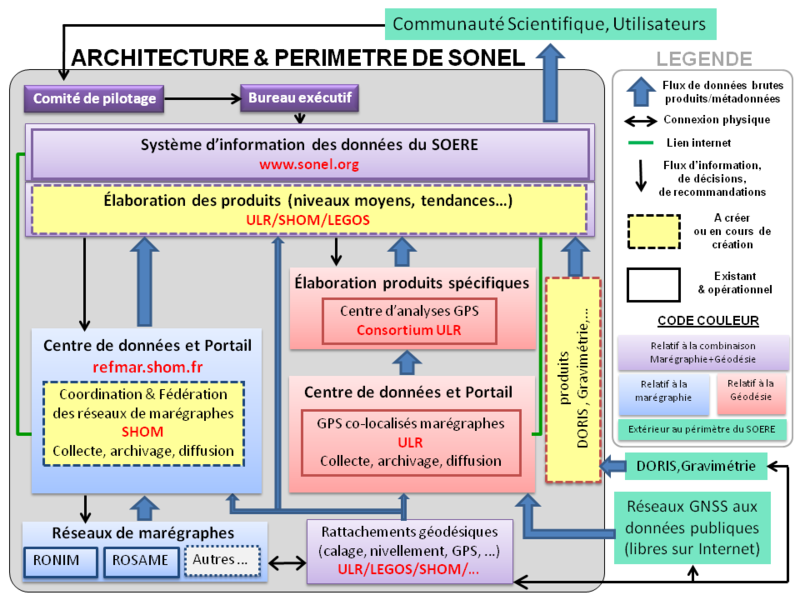 This new station is operated by the Senegalese “Direction des Travaux Géographiques et Cartographiques” (DTGC) and its data are public and freely available in accordance with the Oceanographic Data Exchange Policy of the Intergovernmental Oceanographic Commission of UNESCO at the SONEL website. 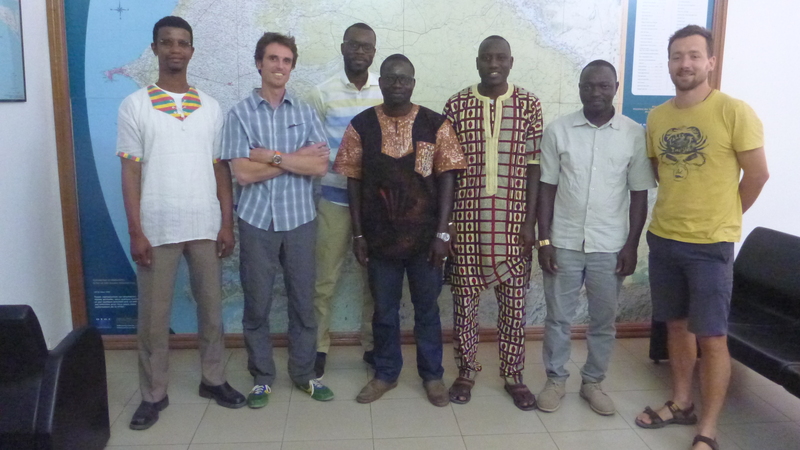 The picture on the right shows the actors of this installation (from left to right) : Oumar H. Ka (Director of DTGC/ANAT), Thomas Donal (Surveyor IGN), Abdoukarim Mbengue (IT DTGC/ANAT), Ibrahima Ndiaye (Chief Surveyor DTGC/ANAT), Dr. Issa Sakho (Assistant Professor University of Thiès), Madiabe Diouf (GIS responsible DTGC/ANAT), Etienne Poirier (Engineer LIENSs - Université de La Rochelle). Link to the SONEL webpage of this GNSS station (DATG), where further details and data can be found. Le Cozannet G., Raucoules D., Wöppelmann G., Garcin M., Da Sylva S., Meyssignac B., Gravelle M., Lavigne F. (2015). Vertical ground motion and historical sea-level records in Dakar (Senegal). Environnmental Research Letters, 10, doi:10.1088/1748-9326/10/8/084016. This is to mention once again the special issue of Copernicus journals called “Developments in the Science and History of Tides”. 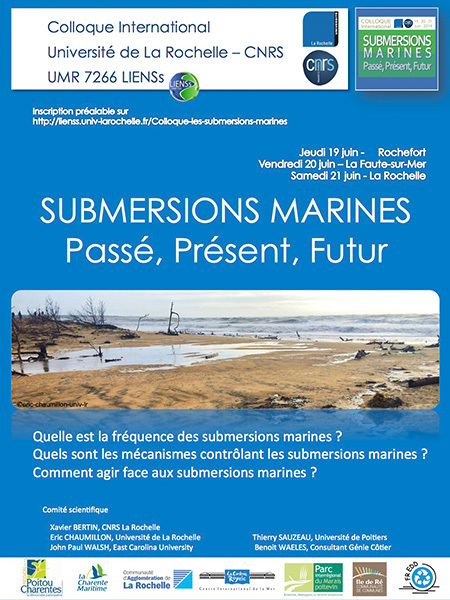 The issue is open to any aspect of the subject including the present accuracy of coastal, regional and global tide models, tidal dissipation and its role in geophysics, internal tides and their role in mixing the ocean and in the global ocean circulation, secular changes in tides, and new techniques for measuring tides and analysing the data. Click on the thumbnail to learn more about this announcement. The special issue is intended to mark the 100th anniversary of the founding of the Liverpool Tidal Institute (LTI). The LTI was established in 1919 and for many years was the world centre for knowledge of the tides, with Joseph Proudman taking the lead in dynamical theories, and Arthur Doodson in the analysis of tidal information from around the world, and on tidal prediction. The year 2019 is also the 100th anniversary of the IUGG, which will celebrate this anniversary during its 27th General Assembly at Montreal (Canada).The IUGG Montreal Assembly will include a Joint Symposium on Tides with IAPSO as the lead Association. Authors can submit their contributions by using the online registration form on the websites of any of the above journals (until the end of 2019). During the registration process, it is important that the correct special issue is selected, which is “Developments in the science and history of tides (OS/ACP/HGSS/NPG/SE inter-journal SI)”. Papers that are accepted for publication will appear immediately on the web site of the appropriate journal. Eventually a printed version of the whole special issue will become available. 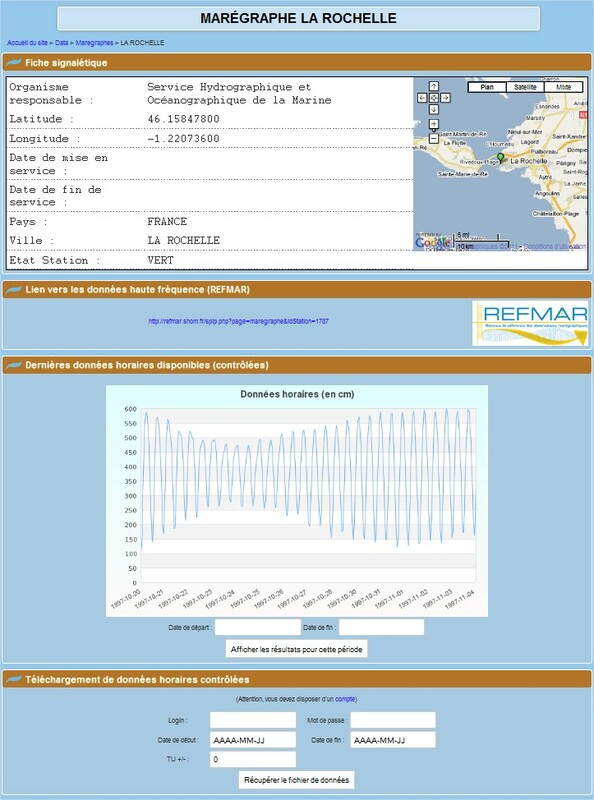 The data and graphs concerning daily, monthly and annual mean sea levels have been available on SONEL since October 2010 for the French stations (a link to the PSMSL is provided for international stations when the page specific to the station is identified and the tide gauge is co-located with GPS or DORIS). The means are calculated from the Demerliac filter and the Doodson filter (see details in the article "Calculating the mean sea levels"), with the possibility of a choice for the user. The graphs in the individual pages per station show the means calculated from quality controlled (QC’ed) observations (in blue) and non-QC’ed observations (in red). An example is given on the image below, which is taken from the page of the La Rochelle station. The non-QC’ed observations are files of raw measurements sampled every 10 minutes. A 10-min raw mesurement usually corresponds to a sea level value averaged over an integration period of two minutes (short-term oscillations such as waves are filtered out) from 1-second samples. They are not in any way verified by SHOM, and should therefore be used with the greatest of precaution, even though a high-tech modern instrument is used (See the results of experiments conducted with radar gauges published in Journal of Coastal Research). The 10-min data files are available roughly one week after the actual date on which the measurement was made. The QC’ed observations, which are hourly data files, have been verified by the SHOM, after being subjected to different quality controls. The values come from the 10-min. observation files which are resampled on the hour. The QC’ed data are available roughly 2-3 months after the actual date on which the measurements were made. (For details on the quality controls carried out by SHOM). Only the daily, monthly and annual averages calculated from QC’ed data are available. They are presented in the form of a two-column matrix : the date (in decimal years) and sea level (in millimetres). The format adopted is that of the PSMSL, as are the calculation criteria for the monthly and annual means, in particular for the issue of observation gaps. The extension ".slv", for the type of quantity "sea level". | | |-- RECENT -> with the 50000 latest observations at 10 min. legos : contains the tide gauge observations of the ROSAME network and that of Sao Tomé run by LEGOS. shom : contains the tide gauge observations of the RONIM network of SHOM. The sub-directory HAUT_10 contains the observations sampled at 10 min. whereas HAUT_HOR contains the QC’ed hourly observations. 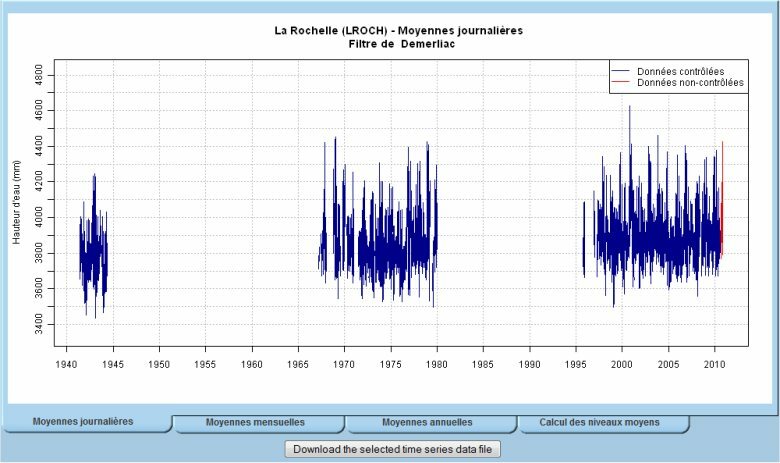 MSL (Mean Sea Level) : contains the daily, monthly and annual means, calculated from the QC’ed hourly observations. The fourteenth session of the Group of Experts for the Global Sea Level Observing System (GLOSS) will be held at the CSIR-National Institute of Oceanography (Goa, India) during the week of 19-23 October 2015. (19-21 October 2015). The GLOSS GE meeting will follow on Wednesday, 21 October (afternoon) to Friday, 23 October. Special session on SARAL/AltiKa satellite altimetry data analysis for sea level studies. Students from India, countries in the Indian Ocean region and Asia are in particular encouraged to participate, as are students working with the Indo-French SARAL/AltiKa mission. Anyone wishing to contribute to the science workshop should send their abstract to Dr. A.S. Unnikrishnan (as.unnikrishnan@gmail.com) before 15 May 2015. Anyone wishing to attend the workshop or the GE meeting should make their wishes known to the GLOSS Technical Secretary, Dr. Thorkild Aarup (t.aarup@unesco.org), who is responsible for the meeting agenda and attendance list. Registration by 1 JUNE 2015 is required due to visa process. See details here : final annoucement (PDF file). The sixteenth session of the Group of Experts of the Global Sea Level Observing System (GLOSS) will take place on 11-13 April 2019. 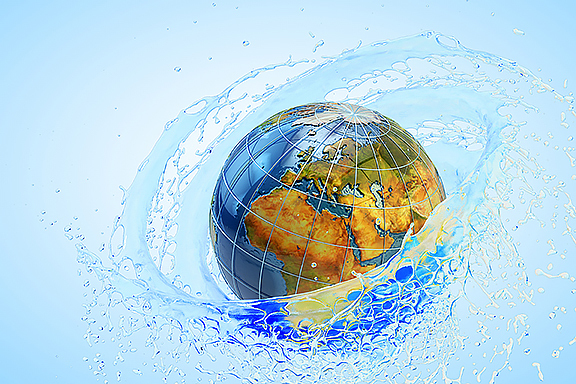 The meeting will be held back-to-back with the IHO Tides, Water Level and Currents Working Group (TWCWG), which will meet from 8 to 11 April 2019. Registration by 1 March 2019 is required. Participants are expected to submit the reservation form with Annex B(Registration form) to Ms. HAN Kwang nam(hkn0112@korea.kr), Ms. KIM A am(1124kar@korea.kr) and the hotel e-mail (haeundae@shillastay.com) in order to make a reservation. The reservation for the meeting will be available until 1 March 2019 with special rate as described below. Find the action list for 2017-2019 on-line, as agreed at the GLOSS-GE-XV meeting. The standard SONEL procedure of collecting GPS data files operates daily in an automatic mode. It treats the data that was observed and made available within the past 61 days. Out of this automatic data flow, the SONEL team is manually retrieving data files with a longer than 61 days data latency, whenever they have been informed of their availability. In order to keep updated the groups that are performing GPS data analyses, we provide here a summary of those data files that have been retrieved manually over the past year or so (Jan. 2013 to March 2014). The summary is given using the same format as previously. See more information in the previous news about this topic. Two files describe the manual updates : one is reminding the data files that have been downloaded manually in 2013, and the second one for the period since the beginning of 2014. The summaries concern the data files that have been manually downloaded on SONEL, that is, those data files observed and made available with a latency of more than 61 days after the day of measurement. For a single stations, the different lines correspond to different download dates. For each download date, the first and last day of downloaded data are given without taking in consideration the probable gaps during the period. Researchers from the joint research unit "Littoral, Environment and Societies" (LIENSs, CNRS / La Rochelle University, team Physical Dynamics of the Littoral) in collaboration with the Portuguese National Civil Engineering Lab (LNEC, Lisbon) have investigated the storm surge associated with the storm Xynthia (February 2010) in the Bay of Biscay, combining in situ measurements with numerical modeling. Their results show that the exceptional storm surge during Xynthia was amplified by the presence of young and steep waves in the Bay of Biscay, related to the unusual track of Xynthia. This study also shows the occurrence of a resonant phenomenon over the shelf, which explains the development of 6 hour oscillations after the surge peak. 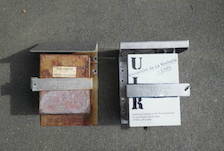 Bertin, X., Bruneau, N., Breilh, J.F., Fortunato, A.B., Karpytchev, M., 2012. Importance of wave age and resonance in storm surges: the case Xynthia, Bay of Biscay. Ocean Modelling, 42, pp. 16-30. Due to the combination of a wide continental shelf and their position on the track of mid-latitude winter storms, northwestern European shorelines are exposed to storm surges that often exceed 1 m. Low-lying coasts, such as those of the Wadden Sea, Normandy (English Channel) or Pertuis Charentais (Bay of biscay) are thus vulnerable to marine flooding. The storm Xynthia, which severely hit the coasts of Vendée and Charente Maritime (central part of the Bay of Biscay) in the night between the 27th and the 28th of February 2010, reminded this vulnerability. 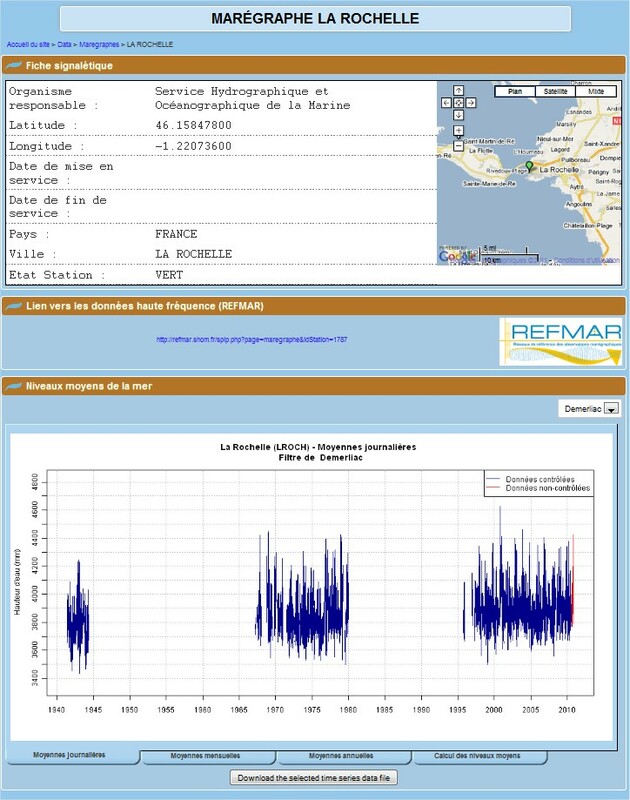 A 970 mbar low-pressure, accompanied with southwestern winds of the order of 100 to 130 km/h (peaks at 160 km/h on Ré island), induced a storm surge with a maximum measured at 1.50 m at La Pallice tide gauge (La Rochelle, Figure 1). The surge peak matched with a high spring tide, causing the overall water level to reach 8 m above marine Chart datum, a value never attained since the deployment of the numerical tide gauge (28th of April 1997, data available at SONEL/REFMAR). Many natural barriers and dykes that protected low-lying zones breached, causing the flooding of large areas and killing 47 peoples and huge material damages estimated to 1.5 billion euros. The analysis of numerical results shows that, in the central part of the Bay of Biscay, the dominant mechanism in the storm surge generation was the SW-oriented winds, which drove an Ekman pumping. This phenomenon corresponds to water transport to the right of the wind direction, due to the Coriolis Effect. The comparison between a quadratic parameterization (wind-dependant only) and a wave-dependant parameterization to compute the wind-induced stress revealed that the storm surge was much more realistically predicted when taking waves into account (Figure 2A). This wind stress is computed based on the wind friction velocity U*, also defined as the ratio between the wave phase speed and the wave age. This friction velocity is thus very important in the presence of young and steep waves, which increase the ocean roughness (Figure 2B). Such young waves were related to the unusual track of Xynthia, which crossed the Bay of Biscay from SW to NE, thereby reducing the fetch to a few hundred kilometers only. Figure 2. 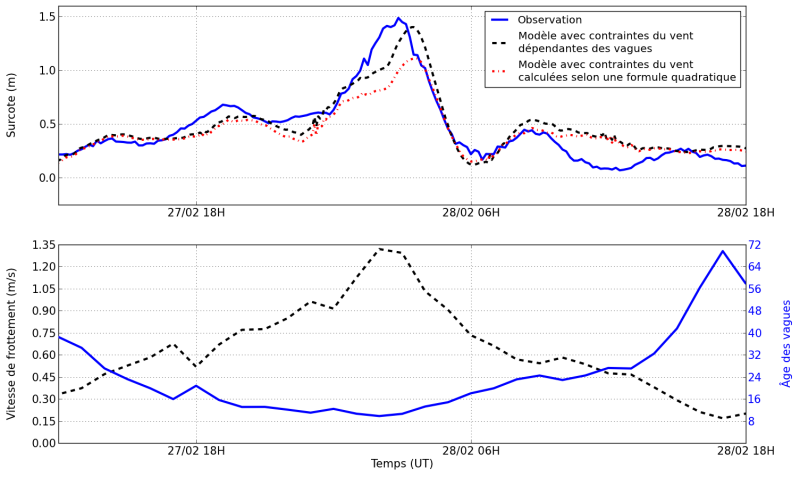 (A) Comparison between the storm surge predicted in La Pallice with a quadratic parameterization (red), a wave-dependant parameterization (black), showing that the second matches much better with the observations (blue). (B) Wind friction velocity (black) used to compute the wind stress and wave age (blue) showing a drop during Xynthia. Finally, field data as well as numerical results show the occurrence of 6-hour oscillations in the storm surge signal, the height of which reaches 0.4 m in the central part of the Bay of Biscay (Figure 1, blue curve). This 6-hour period corresponds to the resonance period of the continental shelf in the central part of the Bay of Biscay. The researchers of LIENSs have interpreted this phenomenon as resulting from the fast displacement of Xynthia (15-20 m/s) in the Bay of Biscay, which induced a perturbation of the free-surface elevation with a significant amount of energy around the resonant frequency. This energy was then amplified by resonance on the shelf. Works in progress suggest that this phenomenon could be valid at other places around the world’s coastlines, such as the central part of the Gulf of Mexico, of for other long waves, such as tsunamis. Tolman H. L., 2009. User manual and system documentation of WAVEWATCH III version 3.14. NOAA/NWS/NCEP/MMAB Technical Note 276, 194 pp. Zhang, Y. L. and A. M. Baptista, 2008. SELFE: A semi-implicit Eulerian-Lagrangian finite-element model for cross-scale ocean circulation. Ocean Modelling, 21(3-4), 71-96. How to be prepared to future submersions in the context of climatic change ? On behalf of GLOSS (Cover letter below), an effort has been initiated to learn of historic, non-computerized sea level data. If your affiliation has such historic records, could you please fill in the questionnaire below (in .doc format, clicking on the image or below)? Or if you know of contacts for such data in need of rescue, could you please provide contact information? Send either to Mr. Patrick Caldwell from the UHSLC by May 1, 2012. The IOC/UNESCO just released the 5th volume of the Manual on sea level measurement and interpretation. This volume is devoted specifically to radar tide gauges. In the decade since Volume 4, they have been applied to measuring sea level at many locations. They have already replaced the previous tide gauge technologies in many countries. Their low cost (in most cases) and the fact that they are relatively easy to install and maintain mean that they have been the technology of choice whenever new sites have been instrumented or older ones refurbished. Part 1 of this Volume 5 discusses topics such as how radar gauges can be mounted over the water to measure sea level. It considers how gauges can be calibrated, either in the laboratory before installation or in the field during routine maintenance visits. It describes how radar performs in comparison to other technologies and discusses how the measured radar levels can be biased in the presence of waves and, consequently, what other technologies must be used in parallel. gauge measurements, and so have been repeated each time, although in different ways. We suggest that new readers of the volumes would benefit from looking at Volumes 1-4 before reading the present Volume 5. Although the earlier volumes date from many years ago, and technology has evolved considerably in the meantime, much of the previous discussion is educational with regard to how the historical sea level data set has been obtained. There are often dangers in exchanging one measuring system for another, in that different systematic methods can be introduced into a long-term time series, so an appreciation of how methods have changed is essential. It is clear that the same kind of mistakes in changing technologies could be occurring now, as radar systems replace others, so we must make attempts to understand them all as well as we can. The online English version is available here. A French version and a Spanish version are also available at the UNESCO documentation server. The event will be held at the "Espace Encan" at La Rochelle, in France. SONEL and the LIttoral, ENvironment and Societies department (LIENSs lab) of the La Rochelle University participate to the organisation of the "Current and past mean sea level observations" session - Tuesday, November 1st, and will animate the OST/ST splinter meeting session gathering the European tide gauges operators at 11:00 am on Thursday, November 3rd. 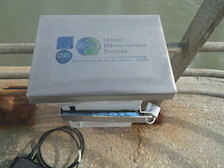 New GNSS permanent station installed at Cherbourg tide gauge site. 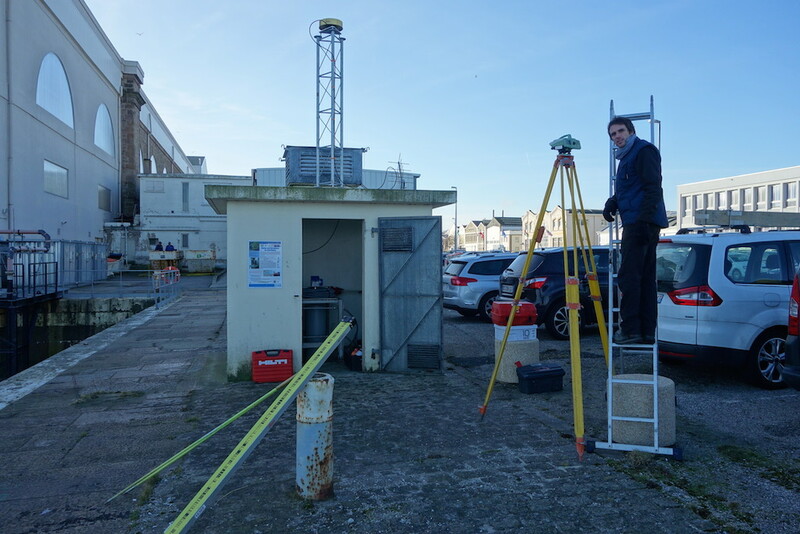 Since the 21st of February 2015, a GNSS permanent station is operationnal at Cherbourg tide gauge site. 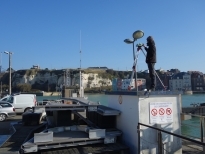 After Dieppe in January this year, it is now Cherbourg (France) that has been chosen for the installation of a permanent GNSS station. Operations took place at the DCNS secured site of Cherbourg from the 16 to 20 Februray 2015 during the spring tides. We were very lucky with the weather during the leveling on wednesday. 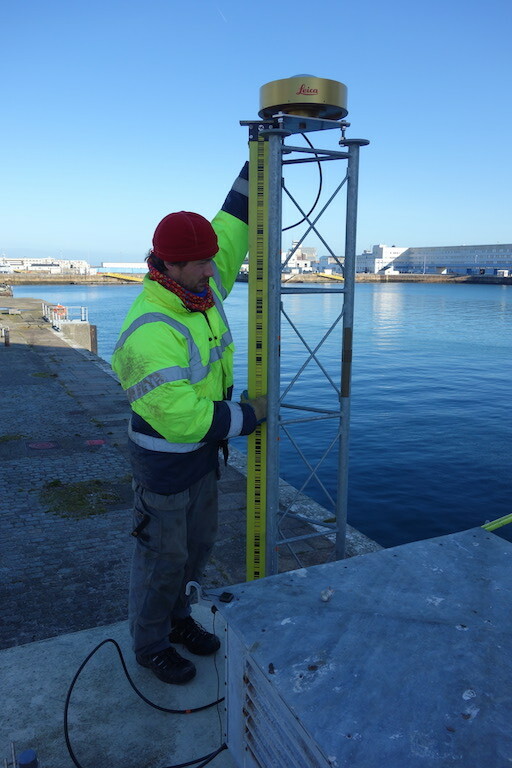 Thomas (IGN) and Etienne (University of La Rochelle) installed a 2-meter steel mast (LECLERC type) right on top of the concrete tide gauge shed. On top of the mast is now a Leica AR20 "choke ring" GNSS antenna that is connected to a Leica GR25 GNSS receiver located inside the shed. The GNSS station is operational and the network connection is optimal. It is recording data daily at a 30 seconds sampling rate. After a few weeks of measurements, a precise reference position of this new station will be calculated. SONEL team would like to thank all people that helped with the success of this operation, especially the DCNS that kindly accepted our presence at the Cherbourg industrial site during one week. 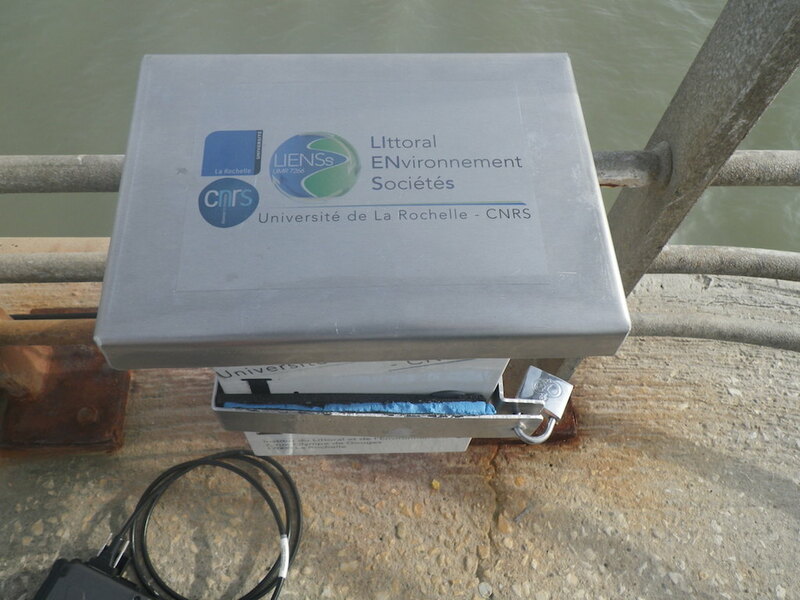 New GNSS station installed at Dieppe tide gauge site. Since the 26th of January 2015, a GNSS permanent station is operationnal at Dieppe tide gauge site. 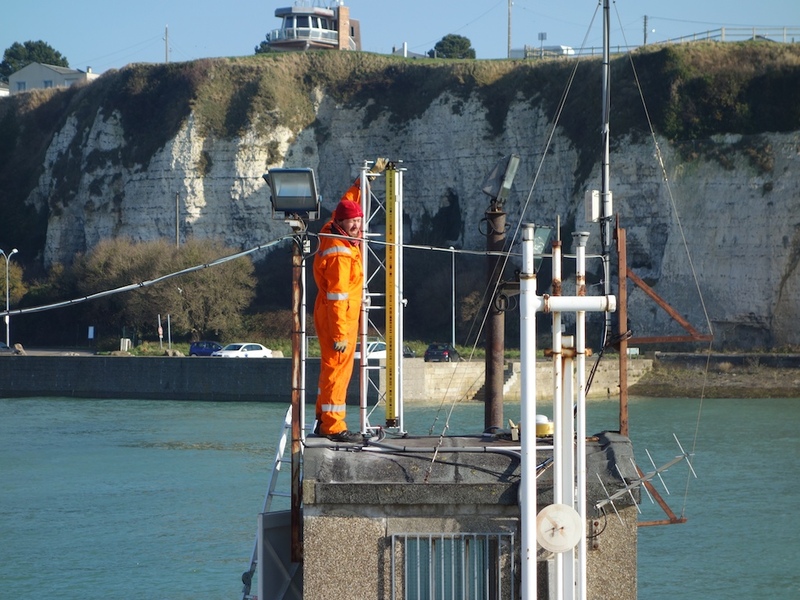 From the 19th to the 23rd of January 2015, Dieppe people have witnessed a strong activity going on around their tide gauge. In fact, a team from SHOM came to install a Yagi antenna. This is to transmit real time atmospheric pressure data together with sea level readings to a METEOSAT satellite. 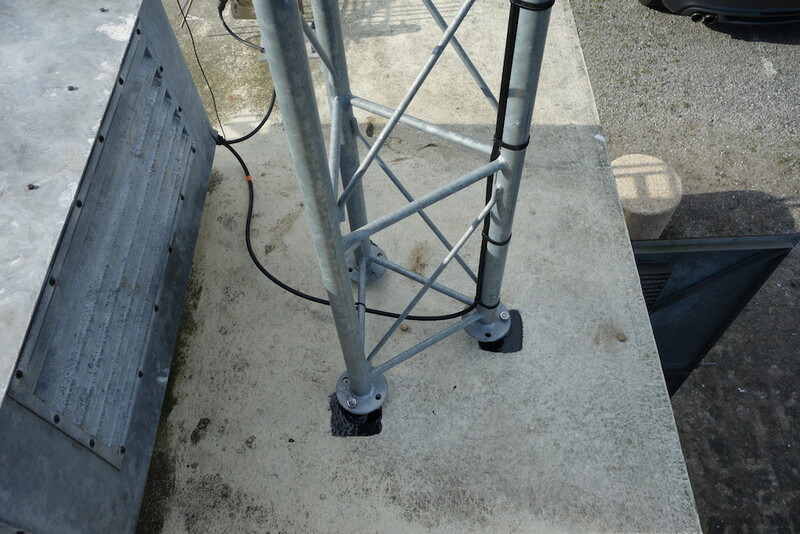 Meanwhile, SONEL people from the University of La Rochelle and IGN installed a steel mast (LECLERC type) on top of the tide gauge concrete shed to support a GNSS antenna. We chose a Leica “choke ring” type AR20 that we connected to a Leica GR25 GNSS receiver. Despite some network telecommunications issues, the full system is now up and running. The next step is to calculate the reference position of the station post-processing a sufficient amount of measures. 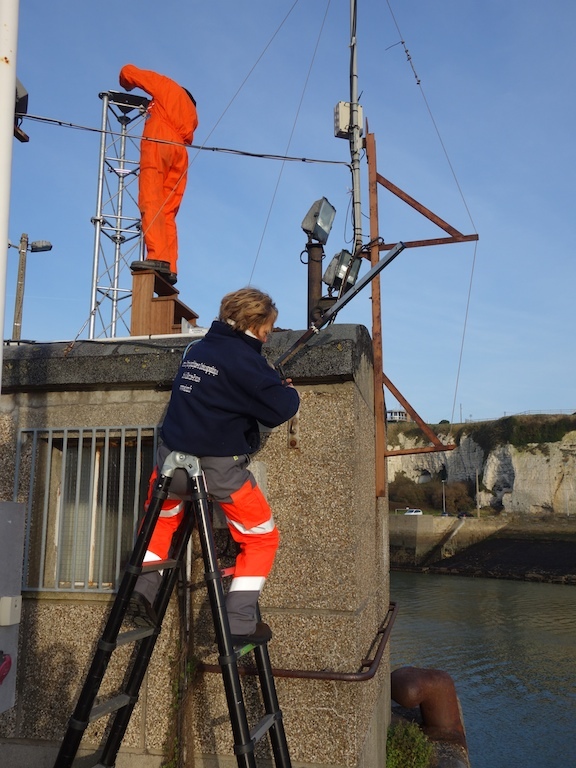 SONEL team would like to thank all people that helped with the success of this operation especially Dieppe harbour that kindly received our new GNSS station. 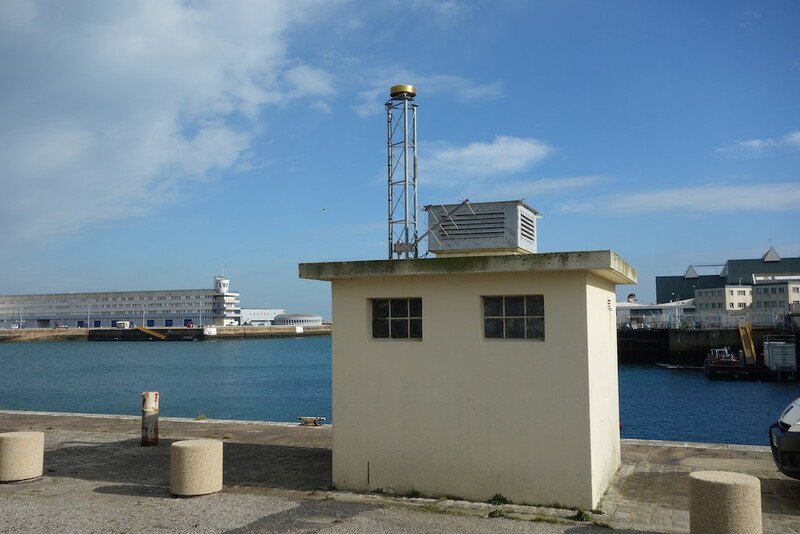 The next GNSS station will be installed in Cherbourg from the 16th to the 21rd of February. At the end of 2016, SONEL database number of GNSS@TG stations exceeded 900 permanent stations (914). 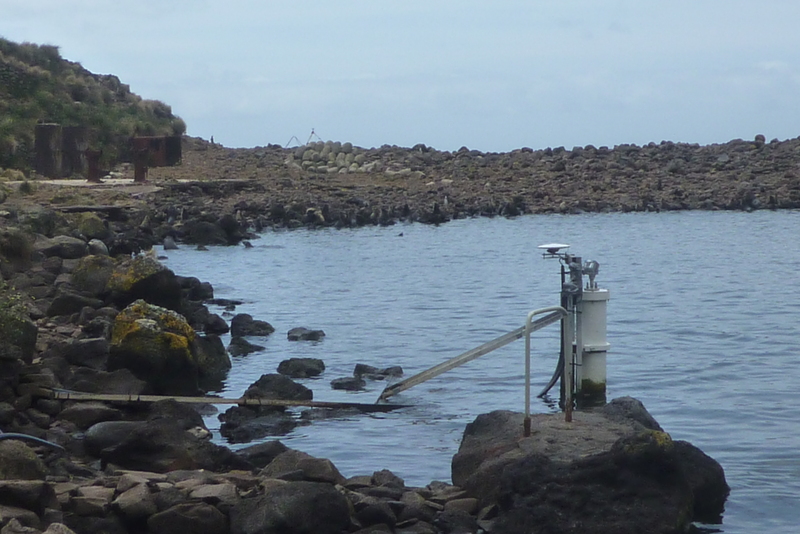 APS1 (SANTANA - DOCAS), installed 2016-01-26, less than 1km from the tide gauge. 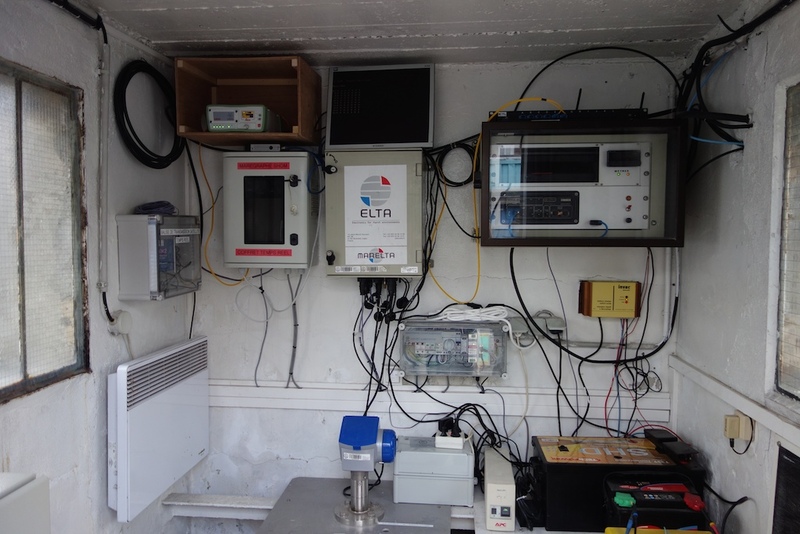 SEY2 (Seychelles), installed in 2015-02-19, it was tied (levelling) to the tide gauge. Regular campaigns are undertaken by the SONEL team to incorporate new stations and observations in the GPS database . If those stations are newly installed, their data enter the standard stream of automatic collection that intercompares the SONEL data holdings with those of the remote data center, and only the missing files within the last 60 days are collected. Consequently, newly reported stations operating for longer than 60 days require a manual procedure. This news is to inform about the results of those manual campaigns of data collection which take place at regular intervals, whenever a new agency contributes its GPS data to the geodetic monitoring of tide gauges (following the free and public data policy of the WMO and IOC programs such as GLOSS). SONEL automatically collects daily the data of several hundreds of GPS@TG stations, and distributes them via FTP and Web servers. Regularly, a few new stations are added, and their data collected at once for long time periods over 60 days. In addition, the IGS or EUREF often alerts on newly available data, either because the remote link with the station was interrupted for a long period of time or because the data files were corrupted but later on the correct files were ultimately gathered, thereby offering the opportunity to complete the SONEL data holdings. The file here provided (click on the right picture) provides a summary on the manual collection campaigns of GPS data that have taken place between January 2012 and January 2013 (included). Those concern observations that may have been recorded between 1986 and 2012. For one station, the different lines correspond to different download dates. For each download date, the first and last day of downloaded data are given, without specifying the data gaps during that period. A news will keep you informed on the manual collection campaigns, likely monthly, whenever it has resulted in substantial new data acquisition. Since the last GLOSS group of experts meeting, the SONEL team at ULR has been working on making the GPS products at tide gauges more readily accessible. A first step towards this goal has been realized by 1 redesigning the homepage, and 2 by providing new tools to display the GPS position time series with options such as including or not the velocity, the annual cycle or the (detected) offsets. The first important change concerns the homepage. A new panel called "Sea and land levels at the coast" has been created and linked to the GPS solutions page. The organization of the data in the GPS solutions page is currently under review. An important perspective is to provide combined products from the GPS and the tide gauge data analyses such as absolute (geocentric) rates of sea level change. This perspective is worked out with our colleagues from the PSMSL where relative (with respect to the coast) rates of sea level change can already be retrieved from the sole analyses of the tide gauge data. Most useful for the analysts, a new tool has been developed to display the GPS position time series. The user can now choose different options such as removing or not the linear trend (velocity), the seasonal signal (annual) or the detected offsets. Consistently, the GPS position data file that can be downloaded is in agreement with the chosen options of display. For example, if the "remove trend" option has been ticked, then the associated data file for downloading will not content the linear trend. The Figure on the right shows various possible options or combination of options for the Perth GPS station (click on the link to access that station and test the various options). This tool may provide substantial help to the analyst for a better understanding and interpretation of the observed signals at a particular station, its noise and overall quality. Researchers from the LEGOS joint research unit (UMR5566, CNRS/Toulouse) in collaboration with the DT/INSU (UPS 855 CNRS/Brest) have installed a permanent GPS station at the Saint-Paul Island (38°41’S - 77°31 E) in the South Indian Ocean, on the GLOSS tide gauge site during the last NIVMER campaign. This installation was done in the framework of the French ROSAME sea level network. It aims at better constraining and explaining the recent estimation of relative sea level trend observed at this site, which is not significantly different from zero. Source: S. Calmant & Fichen, L., 2012. A data archaeology exercise was carried out on ancient sea level observations recorded during the transit of Venus across the Sun observed in 1874 from Saint-Paul Island, 38°41’S - 77°31 E, in the Southern Indian Ocean (Testut et al. 2010). Historical (1874) and recent (1994-2009) sea level observations were assembled into a consistent time series. A thorough check of the data and its precise geodetic connection to the same datum was only possible thanks to the recent installation of new technologies (GPS buoy and radar tide gauge sensor) and levelling campaigns. The estimated rate of relative sea level change, spanning the last 135 years at Saint-Paul, was not significantly different from zero (-0.1 ± 0.3 mm/yr), a value which could be reconciled with average global estimates of 1.7 mm/yr assuming the DORIS vertical velocity estimate at the nearby Amsterdam Island could be applied to correct for the land motion at the tide gauge (Altamimi and Collilieux, 2010). Considering the scarcity of long-term sea level data in the Southern Hemisphere, the exercise provides an invaluable additional observational constraint for further investigations of geographical sea level rise patterns. Figure 1. 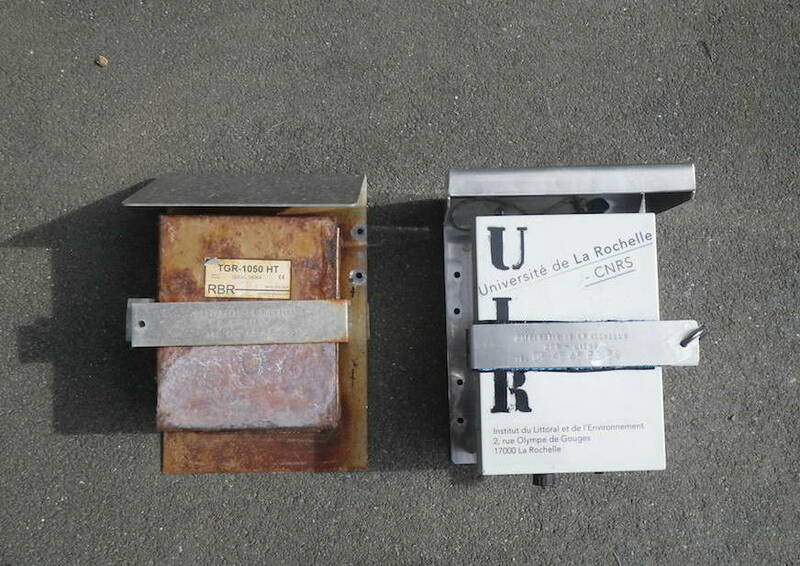 (right) MSL estimates at Saint-Paul relative to the hydrographic zero for the historic observations (1874) and the recent observations (2009). The error bars indicate the uncertainty of the estimates. The grey curve is the annual mean altimetric sea level at Saint-Paul Island from AVISO product and the associated MSL is shown over the period as a rough guide. 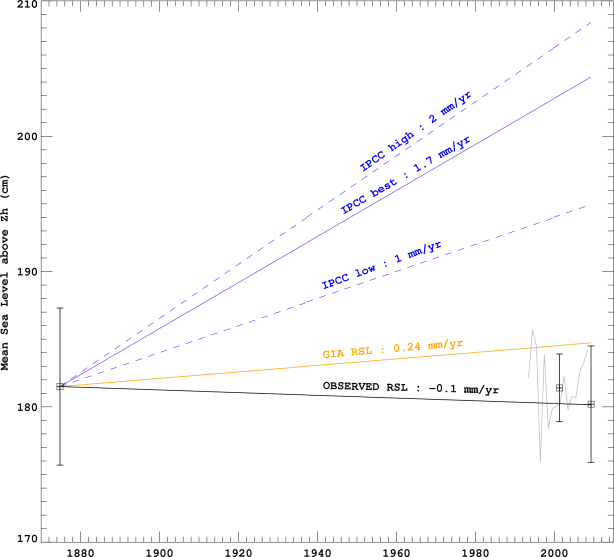 The orange line shows the GIA-induced relative sea level change rate, and the blue lines indicate the lower, upper and best global sea level trend estimate over the 20th century. The data from the permanent GPS station that has been installed will provide an invaluable estimate of the Island vertical land movement. This information is critical to better interpret the rather astonishing result of no relative sea level elevation during the past 135 years. It will also be usefull for geodynamic studies on the dormant volcano of Saint-Paul island or on plate tectonics. Figure 2. The GPS antenna above the tide gauge station in the inundated crater of the Saint-Paul island collapsed volcano. Altamimi Z. and X. Collilieux, 2010. Quality assessment of the IDS contribution to ITRF2008. Advances in Space Research, 45(12), 1500-1509. Testut L., B. Martin Miguez, G. Wöppelmann, P. Tiphaneau, N. Pouvreau, M. Karpytchev, 2010.The sea level at Saint-Paul, Southern Indian Ocean, from 1874 to the present. Journal of Geophysical Research, 115, C12028, doi:10.1029/2010JC006404. 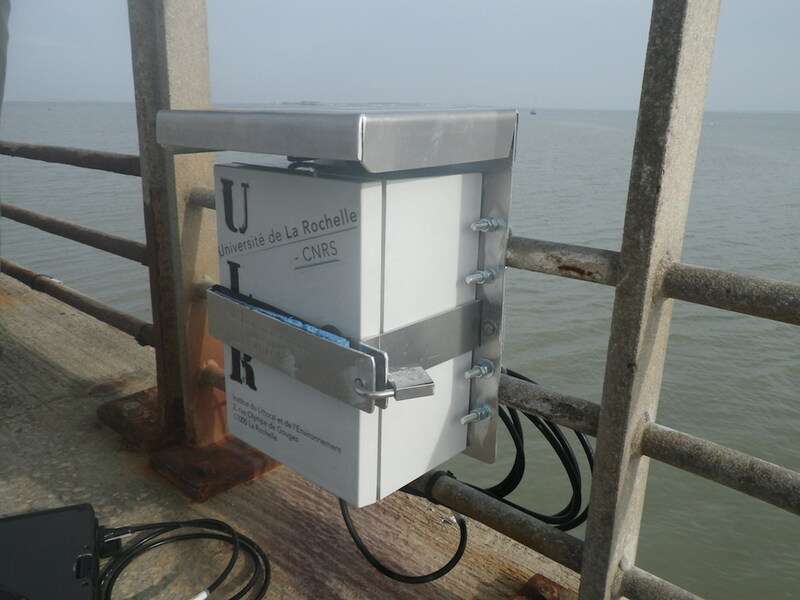 Monday 9th of March 2015, Clément Mayet and Etienne Poirier (University of La Rochelle, France) replaced the power unit of the pressure tide gauge (RBR) located at Aix Island, towards the end of the Barbotin jetty. The operation took place seamless under good weather conditions. The tide gauge has been setup to record at a 1-min. sampling rate with an averaging time period of 40 seconds applied on the 1s raw data. This operation is timely with respect to the forthcoming exceptional spring tides on the 21st of March (equinoxes). The pressure gauge is an important component of the tide gauge station, as it supplements the primary tide gauge (radar gauge). The Intergovernmental Oceanographic Commission (IOC) of the UNESCO publishes the new implementation plan of the Global Sea Level Observing System (GLOSS). The updated implementation plan copes with the new challenges in the field of monitoring sea level for a better understanding of the processes behind sea level rise and variability. Technical Secretary for the Global Sea Level Observing System (COI/UNESCO). The implementation plan provides an overview of the GLOSS programme and its current status as well as a description of the scientific and operational requirements raised over the past years by advisory groups and panels. All GCN stations are required to report data in near-real time, which will be tracked at a Sea-level Station Monitoring Facility. This will involve upgrades in power, data acquisition platforms, and communication packages. However, these upgrades are cost-effective in terms of the benefits that a real-time system will provide for ocean monitoring and improved station performance due to early detection of station malfunctions. Continuous measurements of Global Navigation Satellite Systems (GNSS), in particular the U.S. Global Positioning System (GPS), the Russian GLONASS, or the newly established European GALILEO, or equivalent systems, in the vicinity of the primary tide gauge benchmark (TGBM) are required for all GCN stations. This upgrade will support satellite altimetry calibration and research efforts aimed at determining rates of geocentric global sea-level rise as well as regional changes in sea level. In this line, SONEL plays the role of GNSS at tide gauges data assembly center for GLOSS and provides information on its status through a web-based service. (See the dedicated SONEL webpages). The next meeting of the global sea-level observing programme (GLOSS) is taking place at Unesco, Paris, 9-11 November 2011. Space-based methods for vertical tide gauge control (afternoon of 8 November and morning of 9 November 2011). The GLOSS group of experts meeting itself will take place from 9 to 11 November 2011. The agendas are in the process of elaboration (See 1st link below). Within the framework of the annual chair "Sustainable Development - Environment, Energy and Society", a workshop is organised by Anny Cazenave, Professor at the Collège de France, on the theme : " Climate change and sea level rise ; Coastal vulnerability and societal impacts ". The workshop aims at presenting the most recent updates about sea level observations and projections for the next few decades, highlighting the importance of the regional variability. A synthesis of the various phenomena causing shoreline modifications on interannual to multidecadal time scales will be presented and the causes of observed shoreline erosion for the past few decades will be discussed. More focused presentations about impacts of sea level rise will be provided for a number of coastal regions (Netherlands, Asian deltas, tropical atolls, Quebec and France), with focus on economical and societal consequences as well as on potential adaptation strategies. The attendance is free and open to anybody interested in. The presentations and discussions will be in English. Don’t hesitate to book your agendas. The workshop will take place at the Collège de France, Paris, 10-11 June 2013. Click on the following link or on the image above to download the workshop announcement containing the details of the programme. Evaluate an integrated view of the current state-of-knowledge with the most up to date outcomes. Identify gaps and unresolved questions in any aspect of sea level science and design the paths for future research. Foster international collaborations among researchers of complementary disciplines.